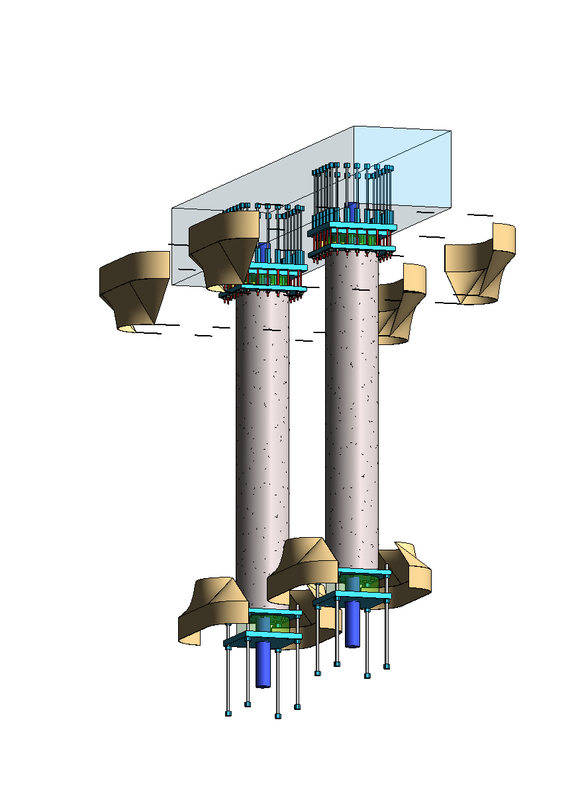 The RAPID Column System consists of a precast column design with connections at the top and bottom of the column. Each connection is either an ordinary moment, a seismic moment (SDD) or a pin connection. The connections consist of embed plates in the foundation and pier cap that provide for a formed socket for the shear pin and a number of threaded couplers to connect the SMA or steel connections to the embedded steel anchor rods. In each connection there is a grout or ECC core that provides vertical compression load resistance. The design of the column is per AASHTO LFRD standards. The vertical reinforcing is either threaded at the ends or special threaded bar is used to allow the column cap plate or SDD cap plate to be installed. The current product charts use 5000 psi normal weight concrete as the column design basis. Columns are pre-designed using 2% and 3%, 60 ksi vertical steel ratios. The column would still have the required seismic ties or spirals per the AASHTO code. The design of the shear pin is based on limitations of the shear capacity of the column. In this way the shear capacities are matched and there are no weak links for shear. The pin sits on the bottom of the lower socket and the upper socket has a clearance to keep vertical load from the shear pin. The design of embeds is based on the standard anchorage of the rods using either an approved anchorage device or typical bond length. Design of steel components for anchorage (rods and nuts) or plates are designed per AASHTO standards. The design of the SDD separates the three key force components at the plastic hinge (shear, tension and compression) into specific materials to allow the device to have predictable and adequate performance. Shear forces at the plastic hinge are carried by a steel pin on the interior of the device. The pin is free to move vertically within the socket in the beam and column; thus the pin cannot carry compression or tension. This decouples most shear forces from the SDD core. Only the SDD requires a few adjustments to the standard concrete methods available in AASHTO for design. The ECC material used in the core allows greater strain to crushing than ordinary concrete: 0.004 in/in rather than the typical concrete value of 0.003 in/in. The ECC has greater residual strength beyond the 0.004 strain leading to greater ductility than ordinary concrete when subjected to overload. This is discussed further in the section on ECC. The SMA material is selected for superelastic performance, rather than shape temperature change performance, in the temperature range for bridge structures. Due to the SCS SDD design, the Nitinol SMA components only carry tension loads for applied moments. Thus for vertical loads, the stiffness of the SDD/column is the same as any typical concrete column. The SMA components (rods or cables) also provide a self-centering action – the material can be subjected to strains up to 6% with very little residual strain. This “super-elasticity” is caused by an internal re-arraignment of the NiTi crystal structure. The crystal change causes the stiffness to decrease but allow significant strain. Once the load is reversed, the crystal structure reverts to the higher-stiffness arraignment. However, there is energy lost in changing the crystal structure which provides energy dissipation. The Nitinol properties are discussed in the SMA section. The Nitinol material has yield strength similar to ordinary reinforcing steel (55 ksi) but has a much lower Young’s Modulus than steel (5,500 ksi). Thus the SDD’s Nitinol plastic hinge has a lower rotational stiffness but similar yield force level compared to a steel system using the same area and configuration. The SDD therefore also provides a fundamental frequency shift for the structure.